Scan10781, originally uploaded by bucklesw1. 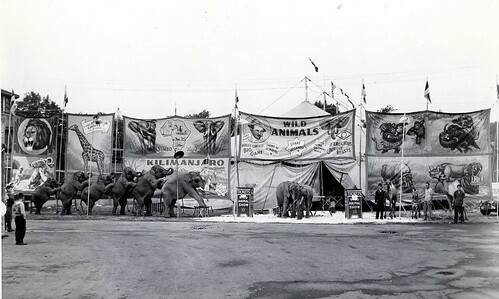 MANY YEARS WE PLANNED OUR LIVES AROUND THE VIDBEL CIRCUS ROUTE. A MEMORIAL SERVICE IN FLORIDA AND/OR NY IN DEC ON AL'S BIRTHDAY. JOYCE, I WAS TOLD, IS AT THE PRESENT, HAVING UP AND DOWN MOMENTS. AND HAVE COUNTLESS TREASURED MEMORIES FOR WHICH WE ARE SO DEEPLY GRATEFUL. WE WILL MISS HIM GREATLY AND REMEMBER HIM WELL. img303, originally uploaded by bucklesw1. img298, originally uploaded by bucklesw1. 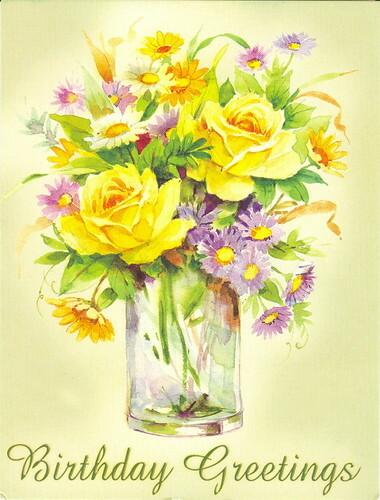 HAPPY BIRTHDAY TO BARBARA!!! Mine was on the 28th of Sept. We are just getting better with age. "Good Grief! 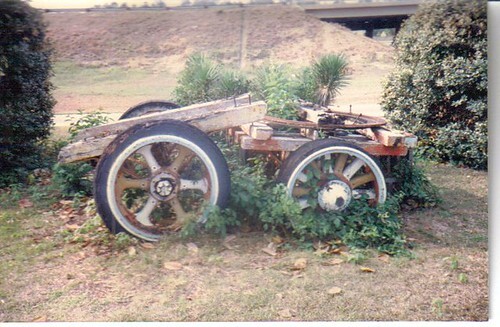 I not only missed the date by two years but had the wrong town." img301, originally uploaded by bucklesw1. img302, originally uploaded by bucklesw1. img300, originally uploaded by bucklesw1. Just got word that Al Vidbel passed away at 4:00 this morning. With many good wishes for our favorite elephant empess on her birthday and every day throughout the coming year. Movin On-2, originally uploaded by bucklesw1. I don't believe that there has ever been any discussion about the appearance of Barbara, Ben and Anna May in the TV film "Movin' On" In honor of Barbara's birthday, perhaps we can get some background information on the filming of this sequence. What other films have the Woodcock Family been involved in? "My movie experience is nil. 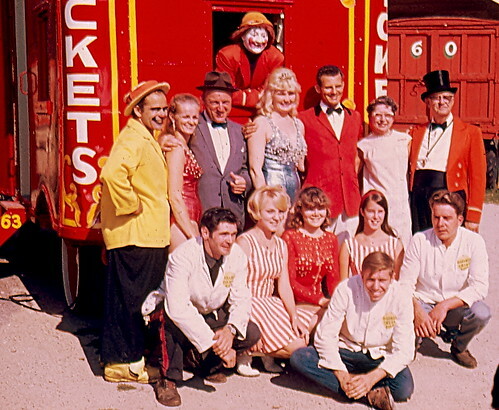 Like most circus people however, we did plenty of TV Shows, Super Circus, Sealtest Big Top, Hollywood Palace, Ed Sullivan, Circus of the Stars. etc. "Movin' On" was the best, done in 1977. In the above picture we see "Anna May" escaping from a truck and casting aside a police officer (Ben Williams)." Movin' On 1, originally uploaded by bucklesw1. In the ensuing chase scene we see "Anna May" following Barbara while both are chased by Officer Ben. 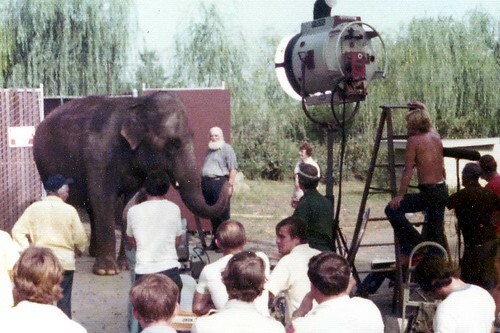 We were at Circus World in 1977 when I received a call from Irvin Feld saying that he had been contacted by a Hollywood Producer friend who was desperately trying to locate someone with an elephant to complete the filming a TV Show already on location in No. Carolina. I told him I could have Barbara and Ben take "Anna May" up there but I would have to remain behind to run the shop. They brought up a truck from Venice (you can see that the movie people painted over the RBBB logo in picture #2). Scan10780, originally uploaded by bucklesw1. 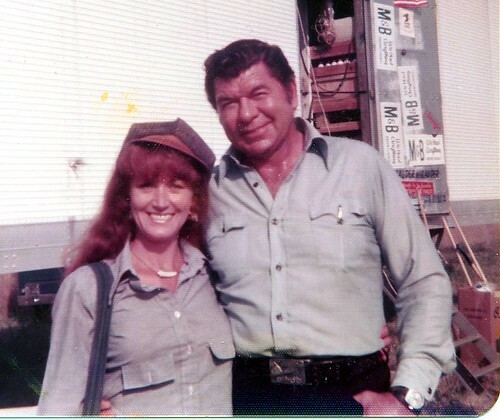 This was a very popular TV Series of the day and starred Claude Akins and Frank Converse as two truck drivers who had been hired to move an elephant from an animal farm down to Florida. 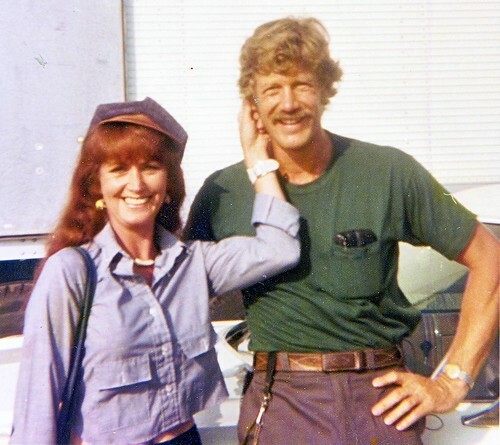 This picture shows "Anna May" and the animal farm owner just prior to him loading her into their truck. As they drive away he displays a large hypodermic needle with the line, "I hope she stays calm until she reaches Florida! While the drivers were eating at a truck stop, a tramp sneaks aboard the truck and immediately hi-jackers steal the truck, elephant, tramp and all. 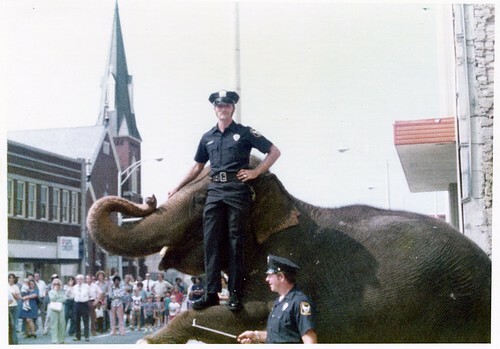 The police later find the truck abandoned in down town Columbia and after opening the doors, they have a wide-awake elephant on the run (as seen in Eric's picture above). Scan10778, originally uploaded by bucklesw1. 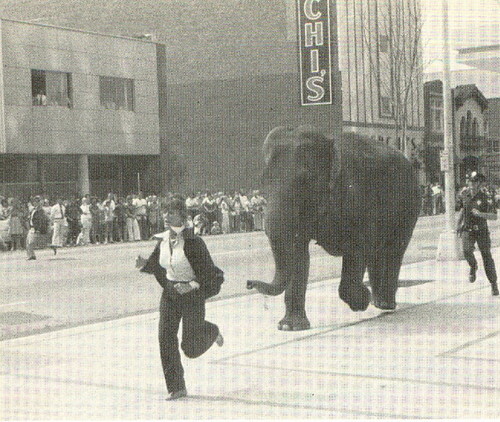 After a series of car crashes and mayhem, the elephant eludes the police, winds up in the countryside and is reunited with the Hobo (Keenan Wynn). I don't remember much more of the plot, such as it was, but the story concluded by "Anna May" pulling a railroad gasoline tanker out of a burning area (assisted by a wrecker with a winch) and saving the city of Charleston. Mr. Wynn was perfect for the part, Ben taught him the proper commands and positioning and he and "Anna May" got along great. "What?......Go off to California and miss the chance to tour with the Greatest Show on Earth?......Don't you realize that we can stay on this show the rest of our lives? Scan10766, originally uploaded by bucklesw1. SAVE0407, originally uploaded by bucklesw1. 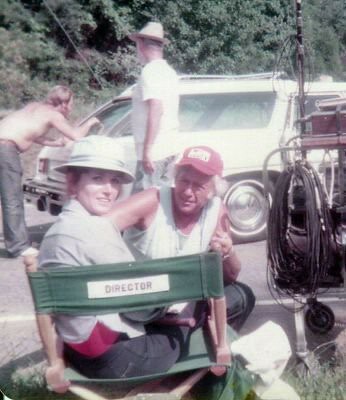 Director Leo Penn trying to get his chair back. Scan10779, originally uploaded by bucklesw1. wom aba-14, originally uploaded by bucklesw1. 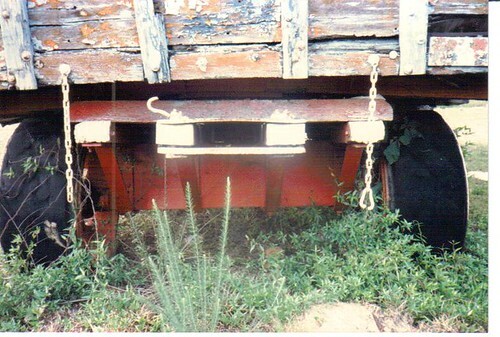 Here are some of the photos Bob Cline was referring too, These were taken in June of 1986 in Eastover, S.C., about 15 miles east of Columbia. 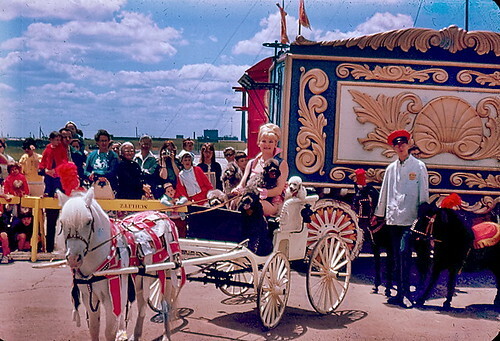 These wagons were left on the fairgrounds along with about 6 other wagons when World of Mirth left Columbia for the last time in the spring of 63. There was a restaurant in Eastover at the Coronet Motel at the intersection of highways 378 & 601 named The Circus Room, at one time it was a great place to eat, one of the best steaks around. 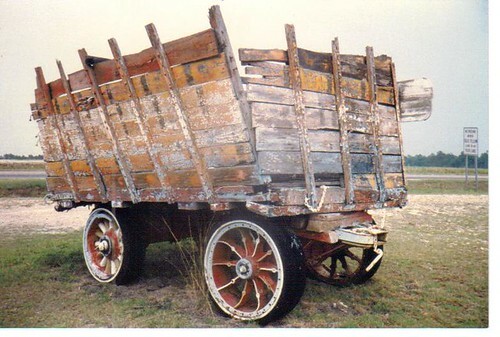 The wagons were put there to promote the place, there were 4 of them there. The restaurant also had a lot of circus memorabilia inside, I don`t know what happened to all the stuff. 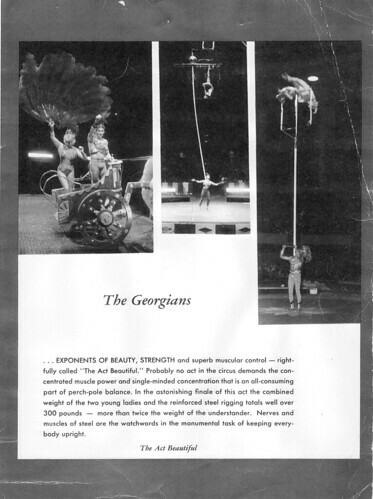 Some of the area circus fans tried to buy some ,including myself, after the place closed, but the Indian guy that owned the motel at that time would not sell any of it. 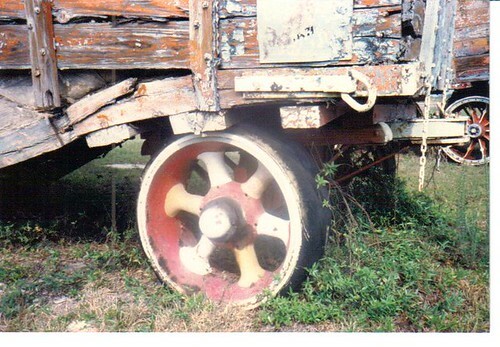 These wagons were used for the scooter ride, and had been filled with concrete at the motel, I guess to keep them stable. 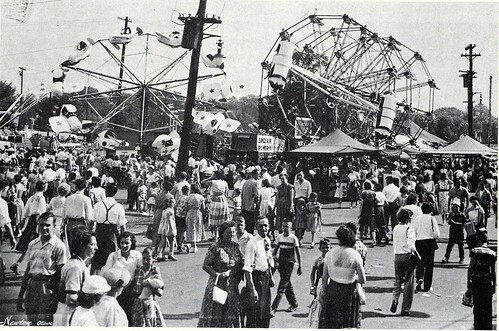 I do know that some of the wagons left at the fairgrounds contained the German Carousel. 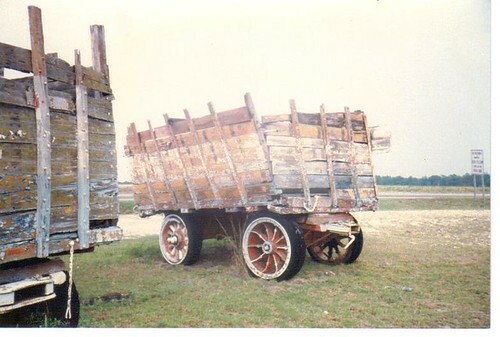 My Dad had a chance to get a couple of the wagons, but he had nowhere to store them. I wish he had been able to have gotten one it would be a treasure to me now. wom aba-3, originally uploaded by bucklesw1. wom aba-1, originally uploaded by bucklesw1. wom aba-8, originally uploaded by bucklesw1. wom aba-12, originally uploaded by bucklesw1. wom aba-22, originally uploaded by bucklesw1. Scan10768, originally uploaded by bucklesw1. Scan10769, originally uploaded by bucklesw1. 50 SPECIAL BUILT ALL STEEL RAILWAY CARS! 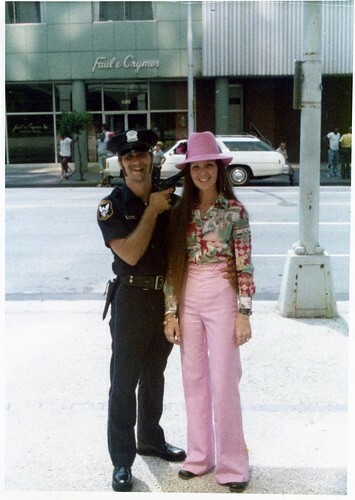 Scan10770, originally uploaded by bucklesw1. 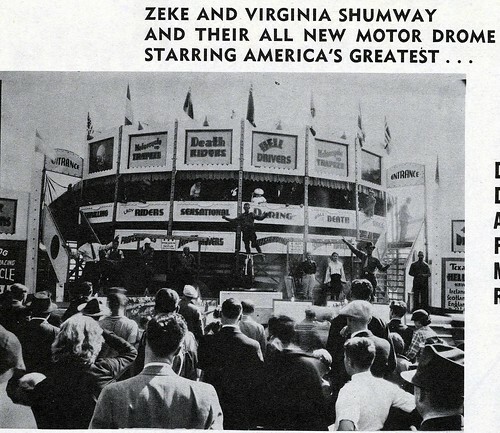 "Two great outdoor showmen are trying to untangle something in their contracts. 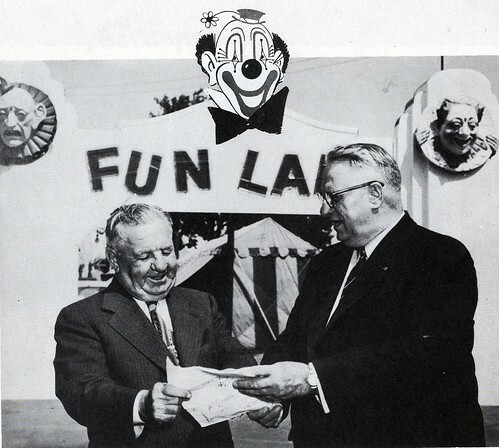 Herbert McElroy, manager of one of the finest and largest fairs in Canada, The Ottawa Exposition, and Frank Bergen, general manager of the largest midway on earth, World of Mirth." Scan10772, originally uploaded by bucklesw1. Scan10771, originally uploaded by bucklesw1. 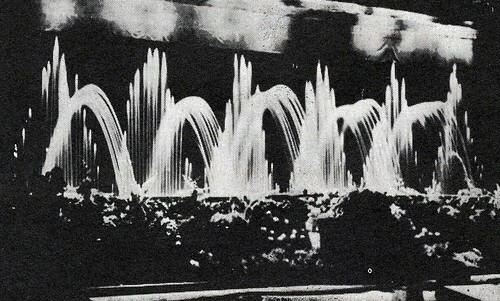 "The fabulous DANCING WATERS is a combination of water, electric power, lights, music, engineering know-how and showmanship, developed through many years of intensive experimentation and research at a cost of a quarter of a million dollars." Scan10773, originally uploaded by bucklesw1. Scan10774, originally uploaded by bucklesw1. Scan10777, originally uploaded by bucklesw1. Scan10767, originally uploaded by bucklesw1. 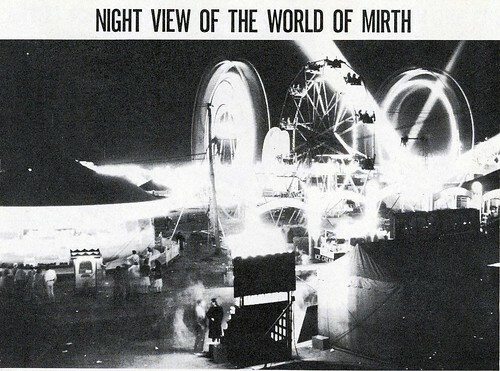 World of Mirth presents for the first time on any midway TONY DIANO'S BIG WILD MENAGERIE. "Elephants from left are: "Betty", "Tusko", "Katy", "Mysore". 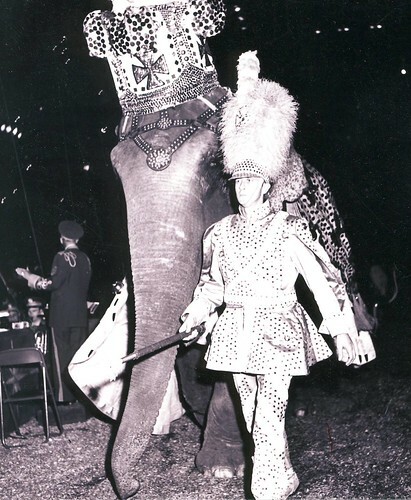 "Calcutta" and "Tommy"
Barbara standing on "Tommy's" tusks. Two Africans in the center are "Nacatala" and "Uganda" held by Leo Harsh "Possum Red". Scan10775, originally uploaded by bucklesw1. Scan10776, originally uploaded by bucklesw1. At least I'm a lot more streamlined than when this picture was taken in Hershey. Mary Ruth Herriott, originally uploaded by bucklesw1. 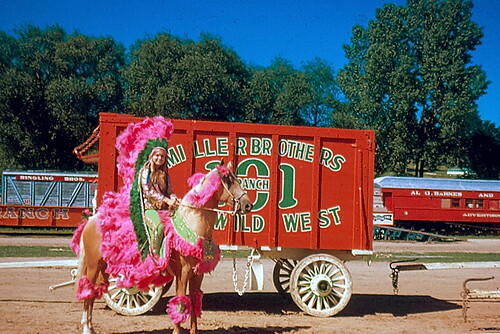 More pictures from the Circus World Museum in 1968. Kasandra Craig, originally uploaded by bucklesw1. 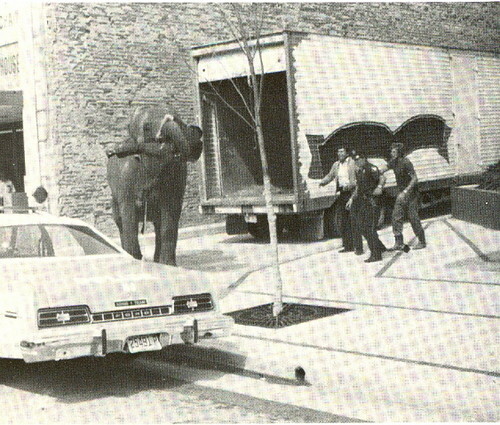 Kandra Craig was brought in (along with Murray Hill's elephants) to replace the Herriotts while they appeared at the Lake front in Milwaukee as seen below. 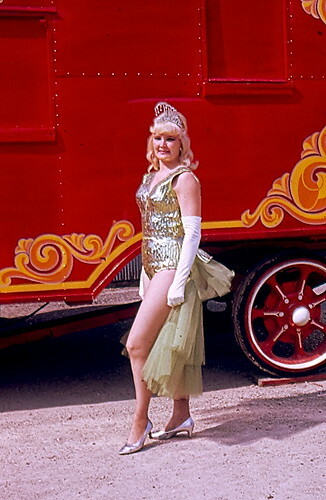 You may recall that Miss Craig was the little girl that Johnny had riding the elephant in spec with the Gil Gray Circus at Disneyland thirteen years earlier. Antar Wazzan, originally uploaded by bucklesw1. Dog act in the Hippodrome, originally uploaded by bucklesw1. Wazzan Family, originally uploaded by bucklesw1. 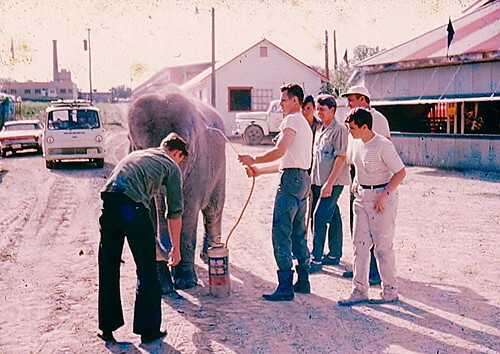 Painting the elephant pink, originally uploaded by bucklesw1. 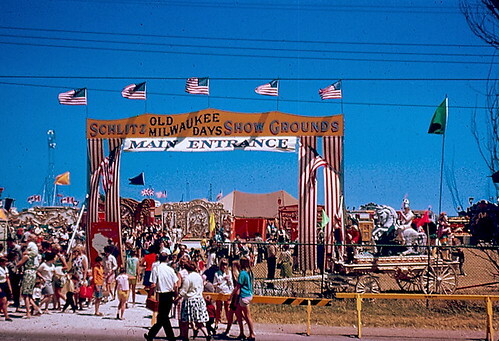 Entrance to Circus Grounds, originally uploaded by bucklesw1. 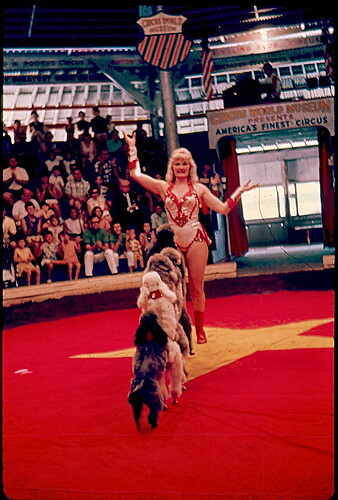 Mary Ruth Herriott's Dog & Pony Circus, originally uploaded by bucklesw1. 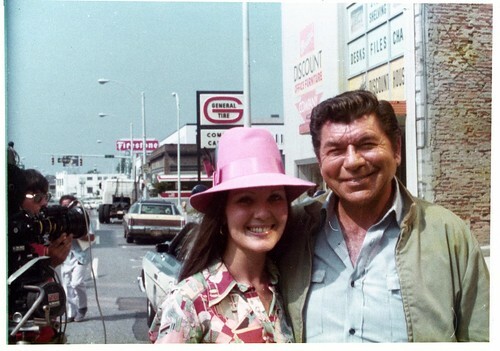 Laura Herriott, originally uploaded by bucklesw1. 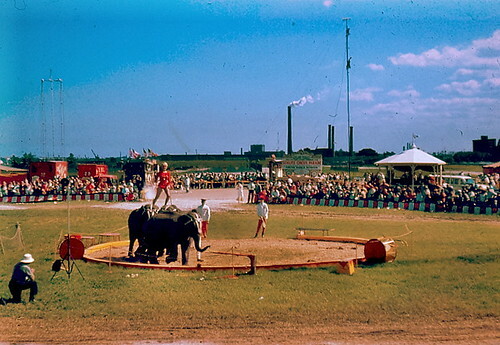 Elephant act, originally uploaded by bucklesw1. 1968 CWM cast & crew, originally uploaded by bucklesw1. "Seated in front , the Prince of Providence"
Kelly-Miller MENAGERIE (1959), originally uploaded by bucklesw1. 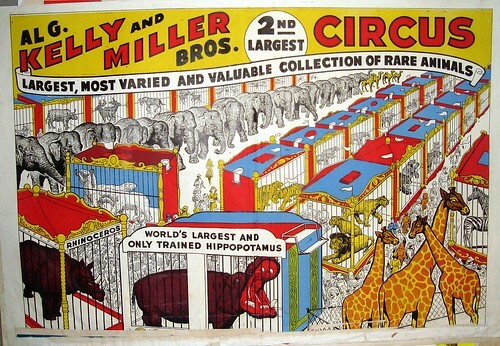 Here is a color copy of the Kelly-Miller menagerie poster that Dave mentioned. 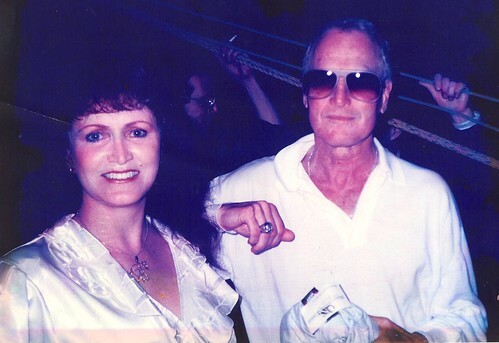 Saddened to learn of Paul Newman's passing. Scan10749, originally uploaded by bucklesw1. PosChMen, originally uploaded by bucklesw1. I think this is the bill Paul was thinking about. 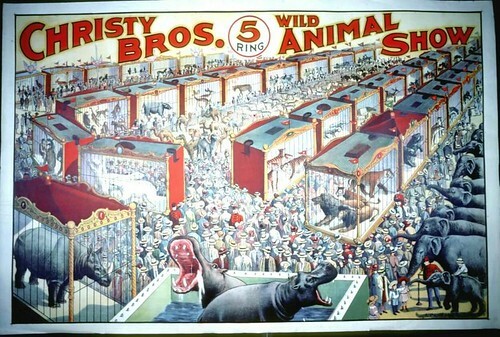 Art Miller told me that he took this Christy Bros litho by Riverside to Central Show Print (I think it was) and told them to redraw it and to (1) move the elephant line to the center, (2) put a cage over a hippo so there would be a place for the lettering and (3) throw in some giraffes. Of course in time people began to copy the bill; eventually it was a stock poster that Enquirer put out and I believe Acme (John and Grace Hoffman) also reproduced it. Bill Kasiska gave me my first copy of this many years ago. I have had to reproduce it here from the Bandwagon as I don't have one of those modern digital cameras. Maybe someone will send in a color pic of this one. PosKMmen, originally uploaded by bucklesw1. Scan10765, originally uploaded by bucklesw1. 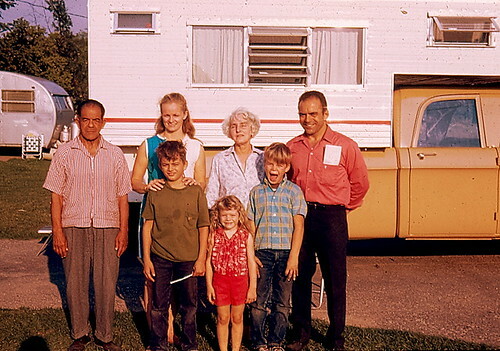 In San Antonio was your dad also visiting circus historian Sturtevant and collector Hertzberg? 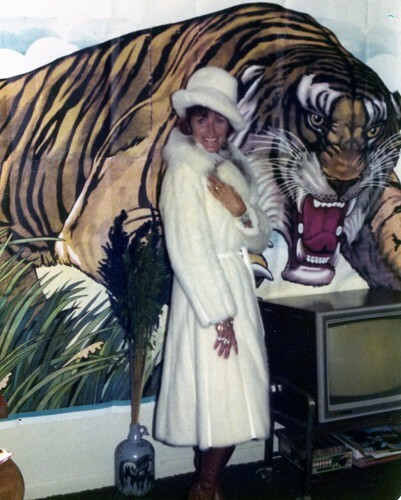 Hertzberg was a supporter of the zoo, I believe. Any idea when he first met those gentlemen? 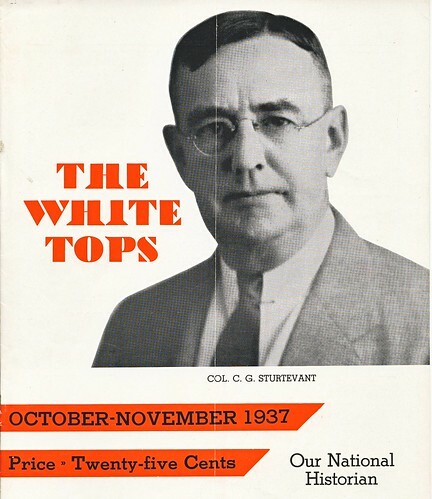 "This four page letter to Col. Sturtevant dated Jan.1, 1941 indicates otherwise. I have selected several random paragraphs from page one that you might find interesting." 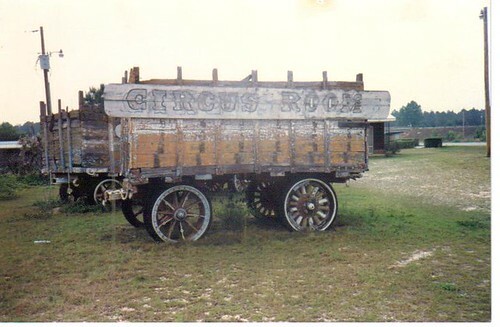 I am the fellow who wrote you last winter re circus parade wagons, etc. I preserved your answer as I consider it a valuable piece of data. 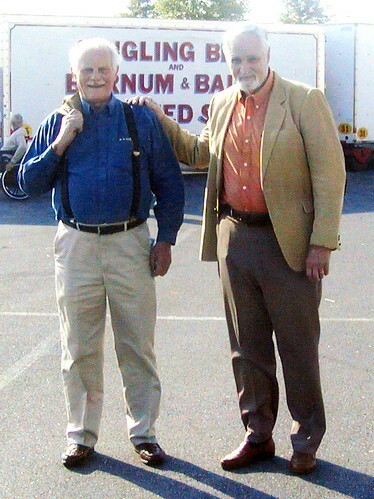 We returned to our home here in Hot Springs following the close of Wallace Bros. Circus last October and will remain until time to open in the Spring. 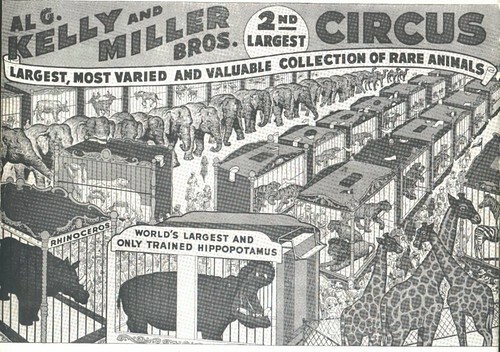 Have a small house and lot here free from encumbrances and one room exclusively for my circus collection which is a magnificent one, as they go, altho quite humble in comparison to those held by the late Harry Hertzberg and John P. Grace. Can only hope that fire or some other disaster doesn't wipe this out as I cannot take it on the road with me. Have Insurance of course but wouldn't replace the circusiana. 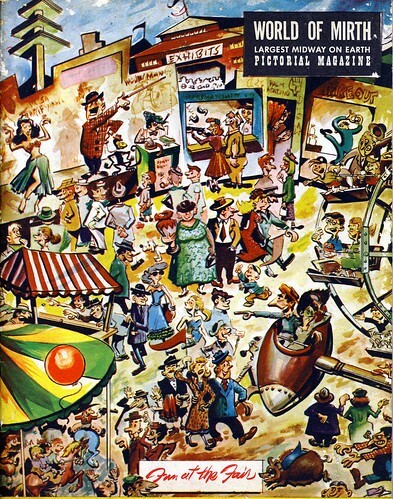 The writer will be 37 years old in May but have been with the mud colored tent, the red wagons and the ponderous pachyderms for twenty-one seasons and lately I find that most of my associates and fans I meet can only remember as far back as 1928 or less. 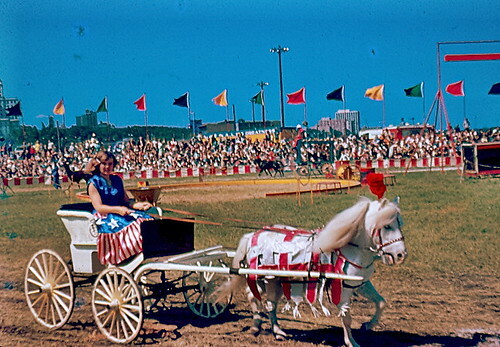 My good wife was born and raised with a wagon show but has never shown any interest in the historical phase of the circus and sometimes mildly scolds me for "raking up the dead" as she expresses it. My kid has three generations of circus folk behind him which he inherits from his mother. He is a great grandson of Hiram Orton, founder of the Orton Show and a great nephew of Miles Orton, the famous rider and circus owner. GEORGIAN TROUPE, originally uploaded by bucklesw1. Today is George Hanneford's birthday. 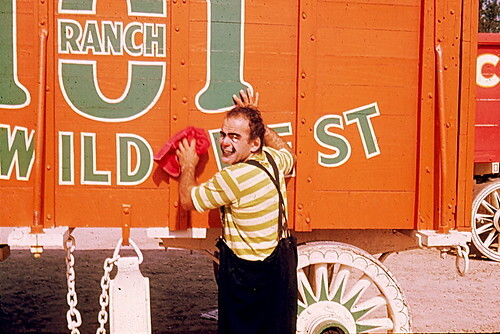 85 years in show business and still driving the bull truck! 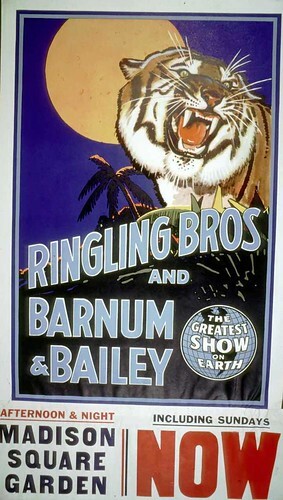 Ringling-Barnum TIGER MOON-MSG (1944), originally uploaded by bucklesw1. 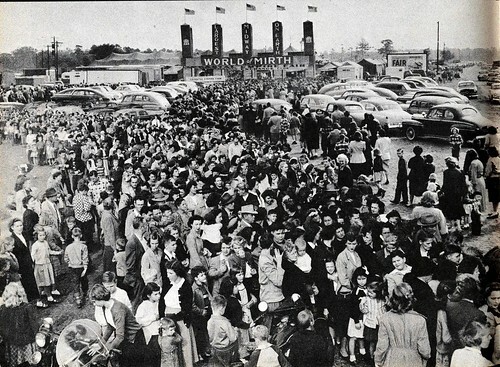 During World War II Ringling Bros and Barnum & Bailey hosted the children of servicemen each spring for a special performance. 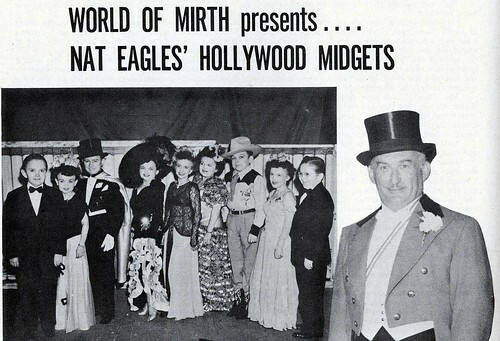 At least one of those performances (April 18, 1943) was featured on the "Fitch Bandwagon" radio program on the NBC "Red" Network. 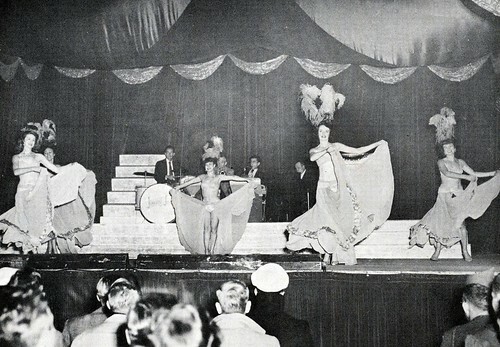 The live broadcast was sponsored by Fitch shampoo ("Don't despair use your head, save your hair - use Fitch Shampoo") took place prior to the actual performance that evening and featured Fred Bradna, Bev Kelly, Merle Evans and others. The program was hosted by Tobe Reed and featured well-known NBC staff announcer Ben Grauer. 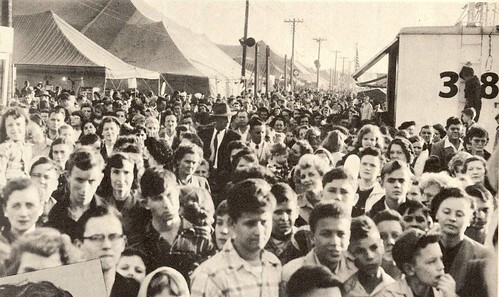 Transcription discs of the 30-minute broadcast were then sent to military bases around the world to remind soldiers that the American circus was one of the things that they were fighting for.